Turkish Talmudist of the fifteenth and sixteenth centuries; brother of Abraham b. Eliezer ha-Levi, who quotes him in his "Ma'amar ha-Yiḥud." Solomon was the author of "Moreh Ẓedeḳ," or "'Abodat ha-Lewi" (published perhaps at Constantinople in 1516), a treatise on the 613 commandments, indicating the passages of the Talmud, Sifra, Sifre, Mekilta, Maimonides' "Yad," and later rabbinical literature in which they are treated. According to Shabbethai Bass ("Sifte Yeshenim," s.v. "Moreh Ẓedeḳ"), the first part is entitled "Moreh Ẓedeḳ," and the second part "'Abodat ha-Lewi." Solomon states, in the introduction, that he composed this work when he was still very young. 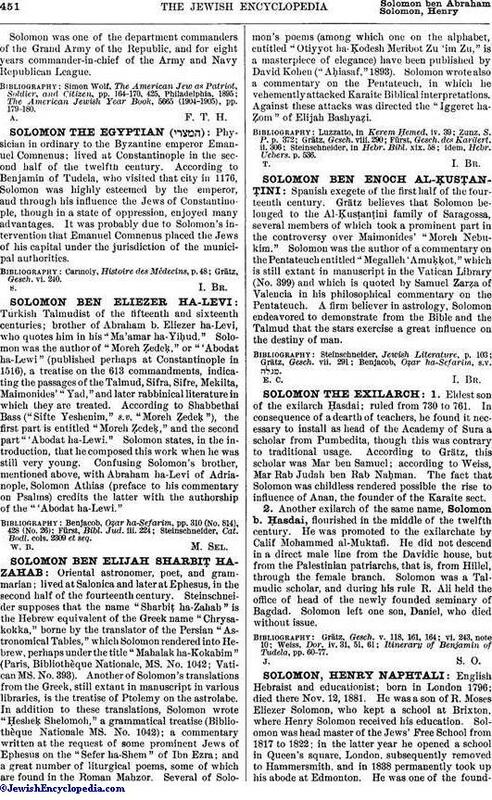 Confusing Solomon's brother, mentioned above, with Abraham ha-Levi of Adrianople, Solomon Athias (preface to his commentary on Psalms) credits the latter with the authorship of the "'Abodat ha-Lewi." Steinschneider, Cat. Bodl. cols. 2309 et seq.